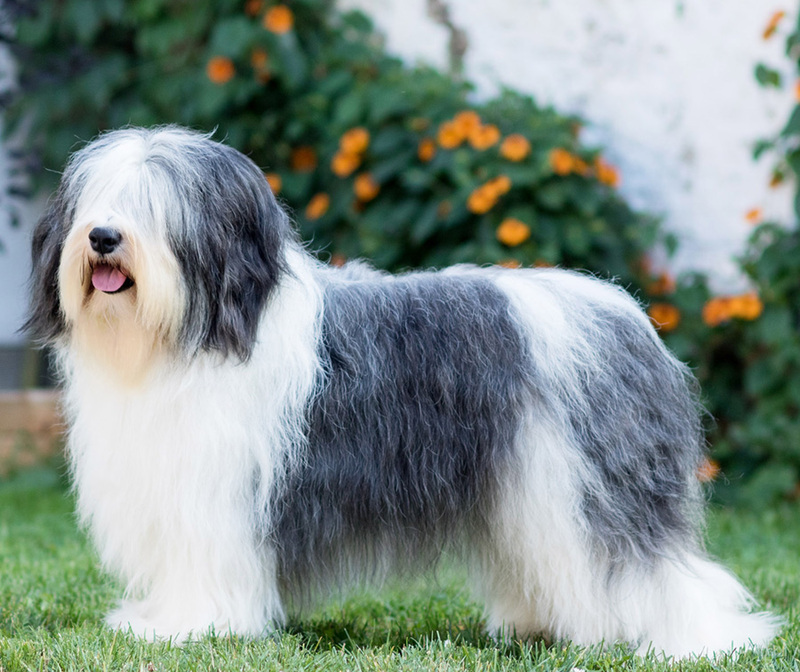 General Appearance: The Polish Lowland Sheepdog is a dog of medium size, compact, B, muscular, with a thick long coat. His well groomed coat gives an attractive and interesting appearance. Important Proportions: The proportions of height at withers to length of body is 9:10. The ratio length of muzzle to length of skull is 1:1; yet the muzzle can be a little shorter. Behaviour and Temperament: Of a lively but tempered disposition, vigilant, agile, intelligent, perceptive and gifted with a good memory. Resistant to unfavourable climatic conditions. Head: Medium dimension, proportional, not too heavy. The thick fur on the forehead, the cheeks and the chin give the head a look of being heavier than it really is. Skull: Not excessively broad, slightly rounded. Frontal furrow and occipital protuberance noticeable. Neck: Of medium length, B, muscled, without dewlap, carried rather horizontally. Seen in profile and from the front : Vertical and straight. Stance well balanced due to a strong skeleton (bone structure). Forefeet: Oval, tight toes, slightly arched pads really hard. Nails short, as dark as possible. Hindquarters: Seen from behind: Vertical, well angulated. Gait/Movement: Easy and ground covering. Walk or trot smooth (without much vertical displacement). The dog often ambles when he walks slowly. Males: 45 – 50 cm. Females: 42 – 47 cm.